The theme of this month’s Bloggers for Peace post is art that demonstrates peace. Nothing sprang to mind so I decided I would create something. I have chosen an image of the Earth viewed from space to show peace at the macro level, without the Earth we would not exist. Inspired by lines from the song The Windmills of your Mind, “and the world is like an apple whirling silently in space”, I chose an apple tree to represent peace at the micro level. Without peace the eco system that the deciduous apple tree relies upon will be unbalanced. 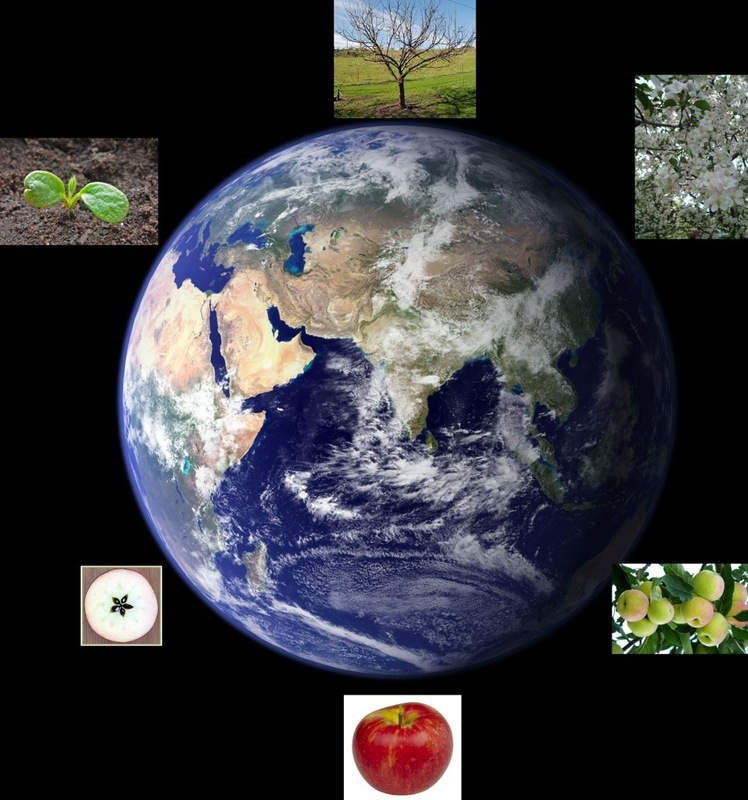 In addition to sunlight and warm temperatures the apple tree’s life cycle is dependent upon the four seasons and their varying climates. During spring the apple tree sprouts new branches, foliage and blossom. Bees and insects are attracted by the flower’s nectar. They pollinate the flowers by transferring pollen to the stigmas of the blooms. Following pollination the apple tree’s production begins. Summer heralds the apple tree in full bloom followed by the development of the fruit. During this process, the tree also produces new growth for the next growing period. Apples become fully ripe with complete colour in autumn. The fruit becomes too heavy for the branches and drops. Leaves change colour and fall and the tree sheds its old and weak branches and stems. The apple tree slumbers during the winter months. From seed to the first fruit takes between 6 to 10 years, reflecting 6 to 10 years of peace. The benefits of peace are an annual harvest of apples and the growth of new trees to feed generations to come. “Round like a circle in a spiral, like a wheel within a wheel, never ending or beginning on an ever spinning reel”. Peace is demonstrated by the living art of nature.